AES256 encryption of passwords and "safety answers". No storage of any password on untrusted remote servers, the user keeps full control! Open source (license GNU GPL v3). No plugins embedded in web browser. Possibility to copy a password without never displaying it on the screen (useful in public areas). Possibility to simply display the password (useful when at home, the app running on a different device than the one where you want to enter the password). 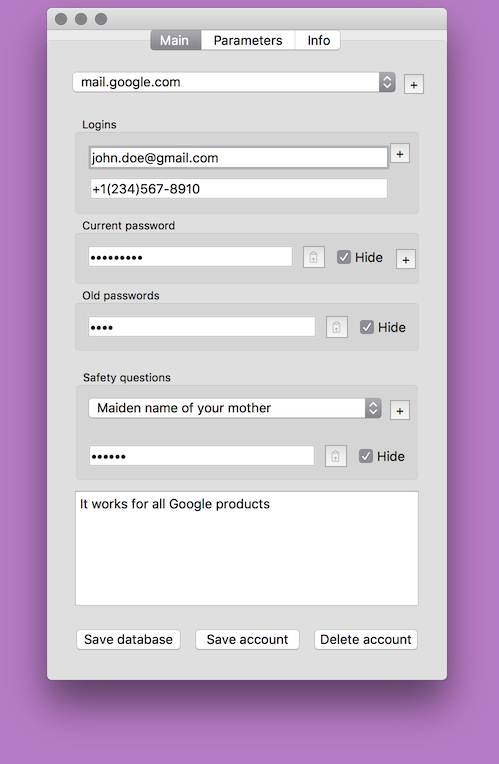 Easy to track your password/login database with versioning tools such as SVN or Git. ... and also on smartphones (soon!). ... and the main feature of BrimbellePass: the ability to store (encrypted) passwords list and logins list in two different, separate XML files. you can store your passwords in a private cloud / git repo or a NAS, and of the logins in a generic cloud like Dropbox. you can store the passwords on a cold storage like a USB key, and the logins on your computer. if one of the service you use is compromised, you're still safe as there's no use of a single file: you need the pair. It's then easy to shuffle the entries on your files to make the leaked file completely obsolete. For your safety, as the software is not in a stable version yet, I would strongly advise you to keep track of your passwords on another medium as well. This software is distributed AS IS, with no warranty expressed or implied. Pre-built versions are not signed yet, and will throw a security warning. But I'm working on it! Discard your OS warnings if you want to use these compiled version. For now, you can go to BrimbellePass GitHub repository and build the sources yourself.